The chance of anvil and cumulus clouds developing Thursday afternoon around launch time has Air Force meteorologists predicting a 70 percent chance of acceptable conditions for the liftoff of a SpaceX Falcon 9 rocket and Dragon spacecraft on a supply mission to the International Space Station. Launch is targeted for 5:55 p.m. EDT from Launch Complex 39A at NASA’s Kennedy Space Center in Florida. The forecast for a Friday launch calls for a 60 percent chance of acceptable conditions. SpaceX conducted a static test firing of the Falcon 9 rocket, shown above, on Sunday. The detailed forecast is below. 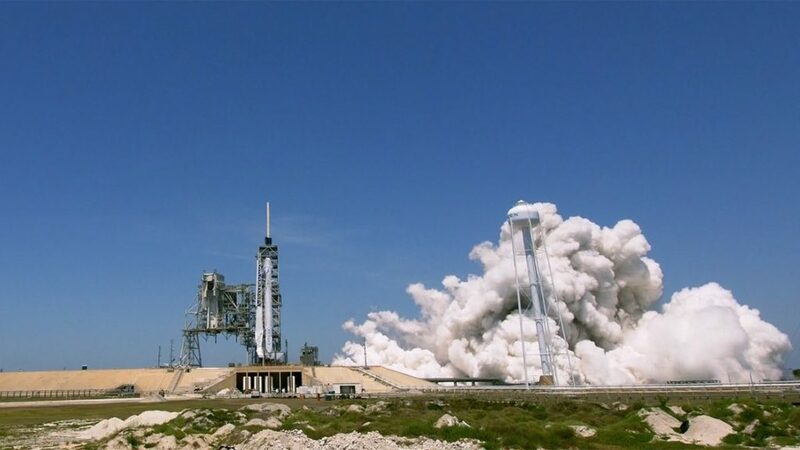 This will be the 100th launch from LC-39A, which was the starting point for Apollo 11’s landmark mission to the moon, the first space shuttle mission and five previous SpaceX flights. The uncrewed Dragon spacecraft will be loaded with almost 6,000 pounds of science research, crew supplies and hardware for the orbiting laboratory in support of Expedition 52 and 53 crew members. The unpressurized trunk of the spacecraft also will transport solar panels, tools for Earth-observation and equipment to study neutron stars. Known as CRS-11, this mission will be the eleventh for SpaceX under the company’s contract with NASA. Forecast details: Moisture has begun to build in aloft today, signaling the start of Central Florida’s convective season. The storms will be guided by the orientation of the Bermuda Ridge axis, which is forecast to gradually shift north of the Spaceport over the next few days. A few storms may develop along the Space Coast today, and the storms will be more widespread on Wednesday as moisture continues to increase aloft. On launch day, the Bermuda Ridge axis is forecast to be north of the area, helping to steer most storms that develop inland, away from the Spaceport. Upper-level winds remain out of the northwest however, which will bring anvil clouds from inland storms back east. The primary concerns will be anvil & cumulus clouds. Max upper-level winds will be northwest at 100 kts at 45,000 ft.
On Friday, similar conditions are expected with an inland push to the storms via the steering winds. The steering direction begins to change on Saturday, increasing the probability that storms will remain along the Space Coast. The main concerns Saturday are anvil clouds, cumulus clouds, and flight through precipitation. Maximum upper-level winds will be from the northwest at 90 knots near 45,000 feet.